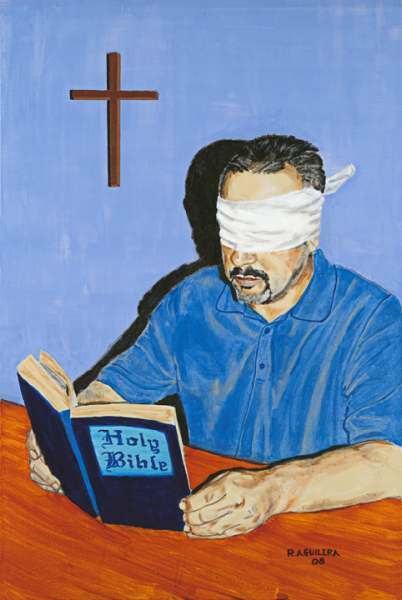 Love the blind reading the bible, so deep. Hi Brother In Christ Jesus - Ray. I have had it in my mind to ask you if you would sell me one of your painting since the first ones came out for show, But I was afraid to ask because as an artist myself I know that some paintings with such deep meanings are sometimes not for sale and I was also respectful that God had a plan for them so I did not ask so when I herd that God Told you to make prints and sell them I was excited to know that I could get one and even more excited about the signing and the promise from God that comes with it. My finances are all screwed up right now so I cashed in the rest of my vacation pay at work so I could get one, as this means more to me than any vacation could. And I also wanted to help a poor neighbour with some of the money I got as well. I will keep you informed as to where it is to go and the impact it is having after it is framed and put up. Ray I know that you have reservations about asking for money for prints of your paintings, But I am really glad God asked you to do this.